Katie and Chris wanted a chic and elegant spring wedding, choosing an elegant color palette of steel blue and deep red for their Memorial Day wedding at Lansdowne Resort. Katie and Chris worked with Laura from Events in the City to plan a super fun wedding for their family and friends, many of whom traveled from Texas and Pennsylvania, while Andrew Reilly photographed the details of the day. I’m absolutely in love with the baby’s breath ceremony arch created by Holly Heider Chapple Flowers, and it looks like cover band GoGoGajet really got the reception rocking! 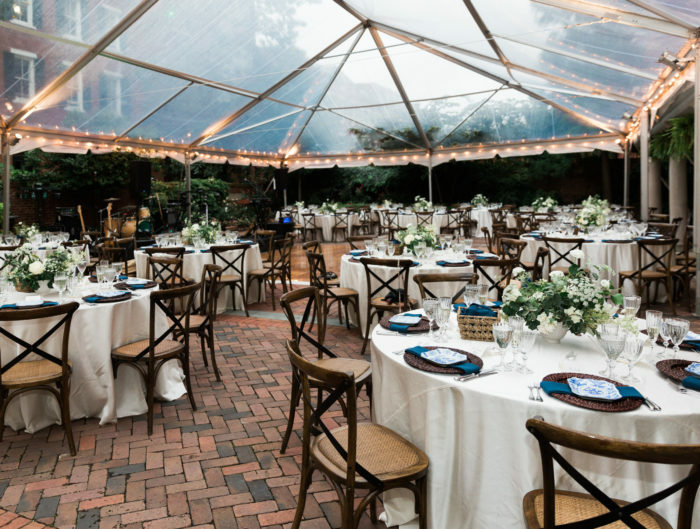 From Katie: I wanted our wedding to be elegant, chic, and classic my favorite color is steel blue (and not just because I love Zoolander), so I centered the wedding style around the color. Because we were getting married on Memorial Day, I wanted to incorporate something a little patriotic without making it completely cheesy and 4th of July-ish. Our wedding colors ended up being deep red, ivory and steel blue, so we could honor our country in our own chic and subtle style. How can I choose my favorite detail? To start, the bridesmaids dresses. I am OBSESSED with them and my friends looked incredible. I was so happy to see them shine! The flowers were more than I could have imagined. 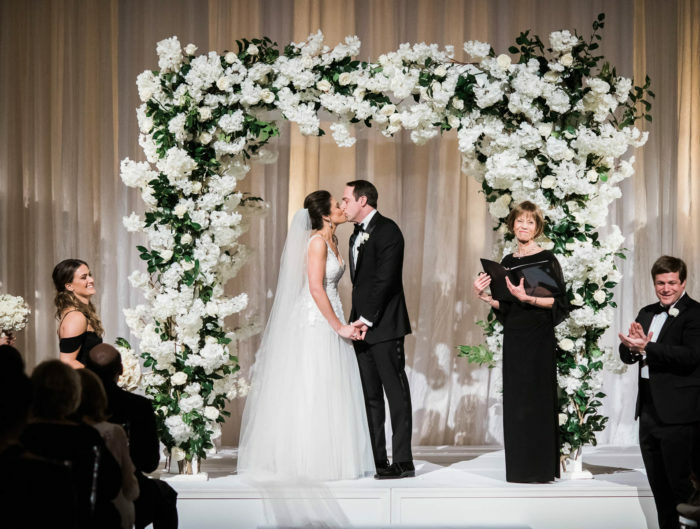 For the ceremony, Holly created a baby’s breath arch which made the entire room feel so romantic. 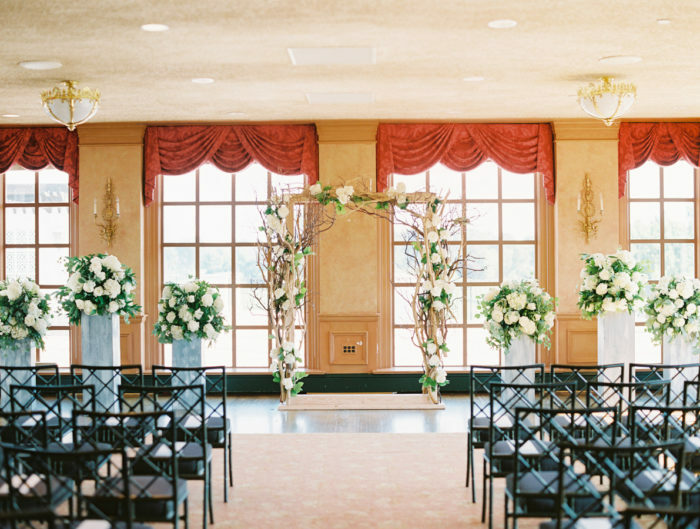 Although at first I wasn’t convinced they were the way to go, I have to mention the red chairs… while I did have a few nightmares about them, they turned out incredible and made our wedding stand out. Our incredible coaster save the dates, wedding invitations, programs and wedding poster were all designed by my husband, Chris Connors. My favorite memory from the wedding was certainly the band GoGoGadjet. They are from Penn State, our alma mater, and they play SICK cover songs, from Lady Gaga, Michael Jackson, Missy Elliot to Stevie Wonder the dance floor was PACKED the entire time. My other favorite moment was when I surprised Chris with a visit from his favorite man on Earth…. Neil Diamond (or something pretty close). He sang 2 classic songs and Chris was shocked! Beautiful photos! I would love to see more Northern Virginia wedding posts — there are so many beautiful venues in the area!